Innovation sometimes takes you off guard. Such a simple app can first appear completely useless to someone like me, but after some thought of the uses of Monster Meter, I realize its ultimate use: Scaring the bejeezus out of your kids or comforting them so they can sleep at night… Created by Appdicted, Monster Meter is available on the iPhone, iPod touch, and iPad for $0.99. I have to admit it: my first impressions on Monster Meter were not good. Nothing happened with this app. It wasn’t a game, it wasn’t a utility. Then I read the App description and thought about the app more carefully. This is a great way to convince your child that there are no monsters in the house. Firstly, you have 4 modes: Radar mode, which uses the camera and overlays it with the radar scanning graphic. 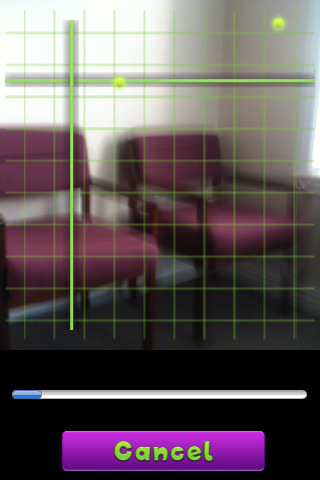 Grid, which again, uses the camera and has a grid-scanner graphic instead. Green Meter, which looks like a toy from McDonalds (great for younger kids). Finally, we have the Metal Meter, which is the Green Meter in a more high-tech look that looks appropriate for “The Incredibles” or “Monsters Inc” fans. Speaking of Monsters Inc., I believe that is where most of the graphics for this game come from. In the title screen, you have a Mike Wazowski look-alike looking through a door. Yeah, it’s Monster Inc. to me. The individual scanner graphics are all very simple but for an app that lasts for 5, 10, 30, or 60 seconds, these little effects are fine. Feature-wise, you have a Safe Mode, where no matter what, no monsters will ever show up. This is a good thing since an accidental monster find in your child’s room while the camera is on their closet would probably traumatize a child for the next few years. I really can’t imagine using the monster scanner to actually show monsters however. Think about what kind of monsters you could imagine as a child. Stuff that kept you up all night… from Large Marge from Peewee’s Big Adventures to the last part of Raiders of the Lost Ark, as a child we had enough to be afraid of… so why have your parent scare you to death by tricking you into thinking that there are multiple monster that they cannot see, cannot do anything about, and are unable to be safe from while your parent is away? That’s just cruel. With PROPER use, this can help calm a child who is scared that there are monsters in their room. Use the scanner with the camera, look at the closet, under the bed, etc, and you can calm them down so they can sleep at night. Just don’t scar your child like Beetlejuice did with his snake form. Just remember, this is not a game, this is not an interactive entertainment app. This is Monster Meter and it is just a tool to calm and/or mentally scar children. AppSafari review of Monster Meter was written by Joseph Ho on November 23rd, 2010 and categorized under App Store, Featured, Fun. Page viewed 5316 times, 1 so far today. Need help on using these apps? Please read the Help Page. a bit like monster scanner, now free in the appstore. Thank you for your review. Monsters showing was added mainly for haunted houses etc (think the Haunted Mansion in Disneyland). This helps the kids believe the monster meter is accurate.